This salad is pretty and delicious and I’ve gotten rave reviews each time I’ve made it. After tasting it, my guests requested I make them this salad for their upcoming affair (Bas Mitzvah/Sheva Brachos, etc.). I must say that it is time consuming, but oh, so worthwhile. I brought it to my friend the day she moved and she told me days later that she is craving my salad! Inspired by a recent Binah Article (07/18/2011) written by Chaya Fleishman, I have made a few changes most notably in the dressing. This salad is quite versatile, as it is elegant enough for a fancy party and simple enough for a weekday dinner. *Sold in grocery/supermarket freezers with the brand name Dyna-Sea. I use the long ones. Rinse rice in a strainer for a few minutes to remove excess starch. Saute rice in oil for a few minutes, then add water and bring to a boil. Lower flame and cover pot. Allow to cook for approximately 15 minutes, until water is absorbed. Let stand for 10 minutes. Combine vinegar, sugar and salt and mix into rice. Cool. Mix together tempura mix and water. Preheat oil in a pot. Deep fry the batter by dripping batter into the hot oil while holding the bowl about 2 feet above the pot. The batter will disperse immediately. Once golden brown, remove from pot and drain well. Allow to cool, then crumble by hand until you get a fluffy, breadcrumb-like texture. Tip: Ready made tempura crunch can be purchased at sushi bars to save time and avoid mess. Combine ingredients in a covered container and shake well to mix. To serve the salad, put the ingredients in a salad bowl or on idividual plates in the following order. 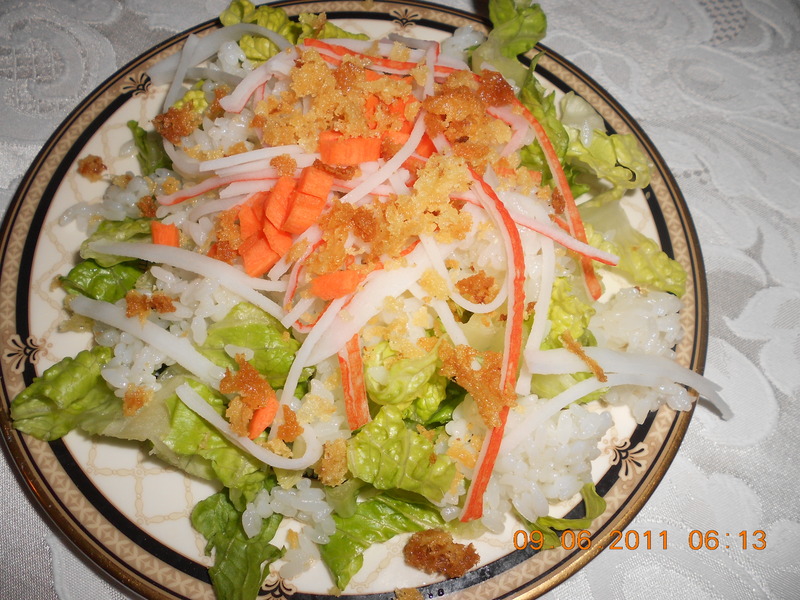 First put the lettuce on the plate (or in bowl), top with rice, kani, carrot and cucumber. Drizzle with dressing (according to salad proportion). Sprinkle with tempura crunch, put a few thin slices of avocado atop salad (in the center of plate) and sprinkle with toasted white and black sesame seeds. This was awesome. Thank you for this delicious recipe! Thank you so much for this awesome recipe! It’s very close to my favorite spicy Kani salad from Yoshi Sushi in Woodbridge, NJ. I recently discovered tempura flakes by Sushi Chef, in my local supermarket and I just gentle toast those in my toaster oven and sprinkle them on right before eating. I think you would like them. This recipe is an absolute keeper. Thanks again!